Bill Parcells has an enormous hold on the hearts and souls of football fans, ranked, for example, in this poll as the sixth best coach of all time. People take his declarative statements as edicts. Parcellisms, made more accessible to the masses, comprise a substantial part of Pat Kirwin’s book, “Take Your Eye Off the Ball”. And one of the notions of that’s beginning to take hold is that Parcell’s theories of how the 3-4 should be played are getting etched in stone as the way it always was played. Without proving it, people are labelling the two gap 3-4s as the “true” 3-4. Other 3-4s are somehow, “not true”. In it they describe some amazing defensive concepts. They are excellent teachers, and I’ve never seen anyone explain force and contain concepts as well as they do. 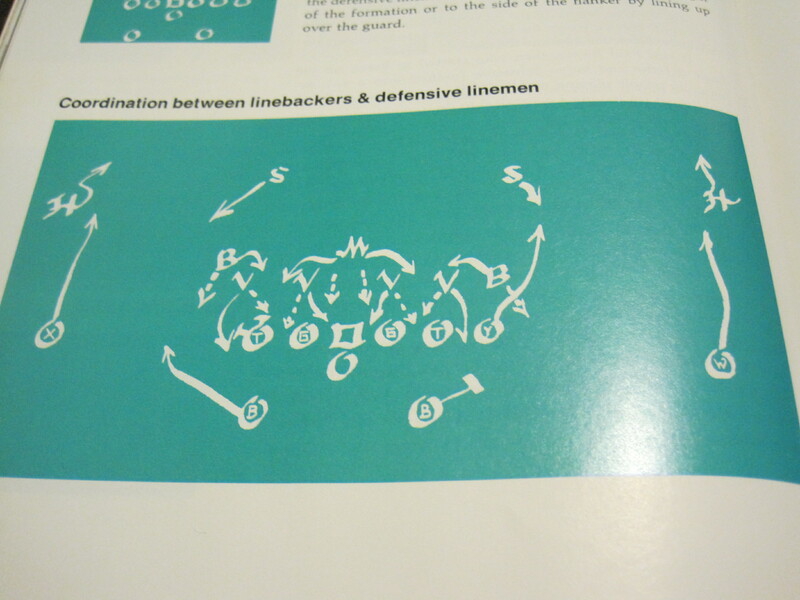 They do it for four man backfields and three man backfields (what they called the four and five spoke contain units). And they also describe the 5-2, which they call defense 72. 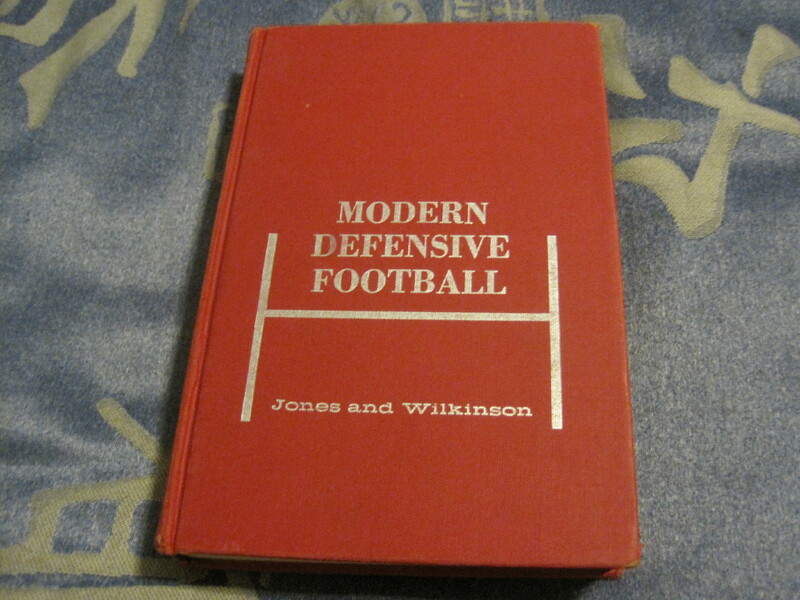 Jones and Wilkinson’s Defense 72. Players are named as if they are playing a 6-2 defense, which was the recommended front for a single wing opponent. Note the hybrid defense end/cornerback in this scheme. Some things to note about these older defenses. Linebackers are much closer to the line of scrimmage, pretty tight in fact. This can more easily be seen in old newsreel footage. 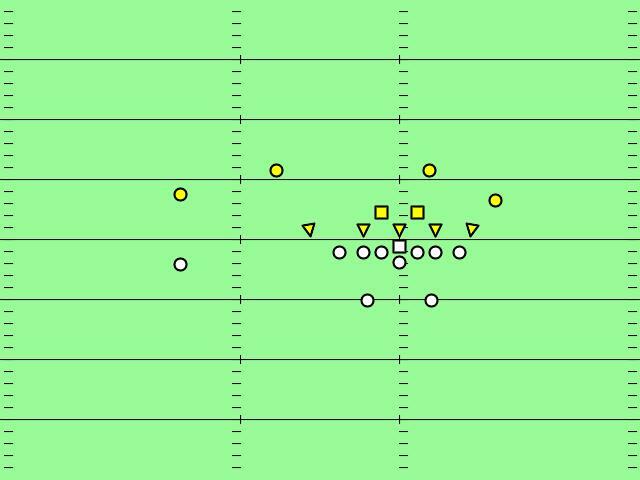 If you can find, say, video of early 1950s Oklahoma and Notre Dame, linebackers are often within a couple yards of the line of scrimmage. An Oklahoma from this period looks something like this. Now, what about the gap assignments? We’ll note that the modern notion of gap control is a relatively recent phenomenon. I explored this in a letter exchange with Coach Hugh Wyatt. He would date the phrase to about 1979, with Monte Kiffen the first known user of the term. The phrase “gap responsibility” is used by late 1960s, so notions of gap management in the late 1950s are stated in terms of things the offense must never do. And other than the nose guard, what must never be done is the opponent must never block you in. This makes it clear: of the 7 line assignments, 6 are one gap assignments. The original 5-2 is largely a one gap defense. Right guard: Line up head up with the offensive center about 2 to 2 1/2 feet off the line of scrimmage. Vary the strength of your charge from play to play. Occasionally, charge hard into the center and attempt to knock him back. Most of the time, charge with enough force to control the offensive center. Basically, you must never allow the center to cut you either way. You must control both sides of the center, maintaining your ability to move to either side. 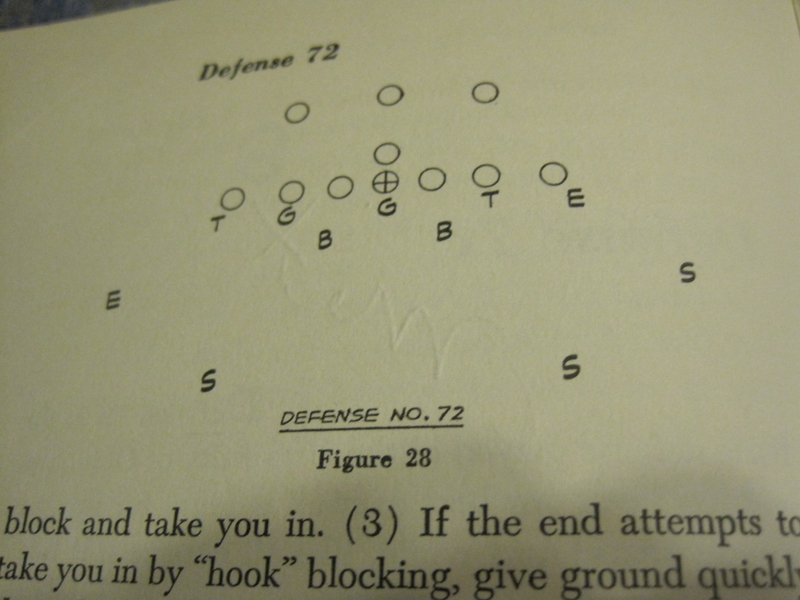 Not only is the original 5-2 largely a one gap defense, the center is flexed. This is a far cry from the modern version of 300 to 340 pound behemoths maintaining gap control across the whole front. In other words, the two gap 3-4 was an evolution from the original 3-4, and further, the one gap 3-4s are more in tune with the original 5-2 than is the “true” 3-4. So when did the two gap 3-4 evolve? Now, I’m curious. It’s documented, for example, that Parcell’s notion of outside run contain isn’t the same as older notions. Older contain strategies (such as the one in Jones and Wilkinson) tend to keep runners inside the contain unit. Parcells was content. however, to run the sweep or pitch out of bounds. Did Parcells invent it? Or was it already common in colleges by the time he arrived in the NFL? Going from one one gapper to three isn’t that much of a reach, especially if your team has three large powerful linemen. 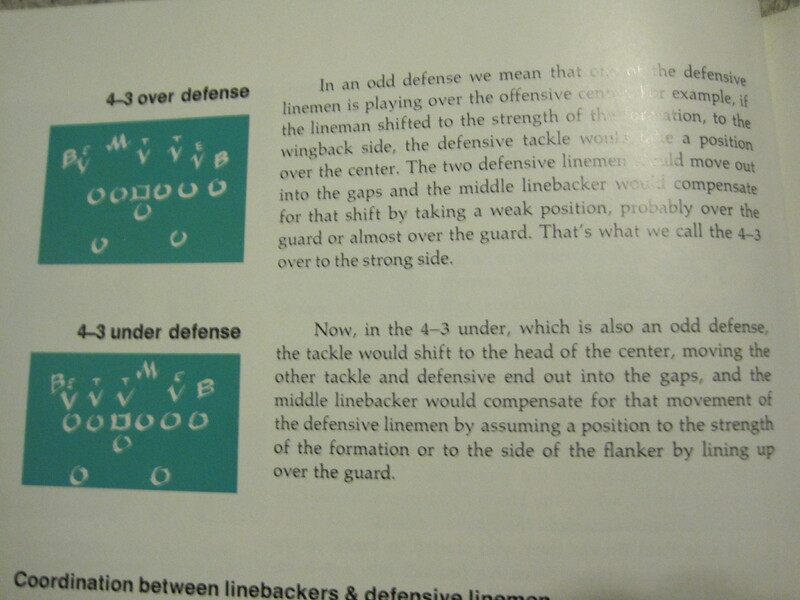 But glancing at a couple articles in AFCA’s “Defensive Football Strategies”, articles on the 5-2 originally published in 1974 and 1980, you see one gap responsibilities being taught, even for the nose guard. I’m not an old coach, who would have this information buried in his bones. But there is more to college football defense than a two gapping 5-2, and the paths from the past to modern times more complex than many realize. 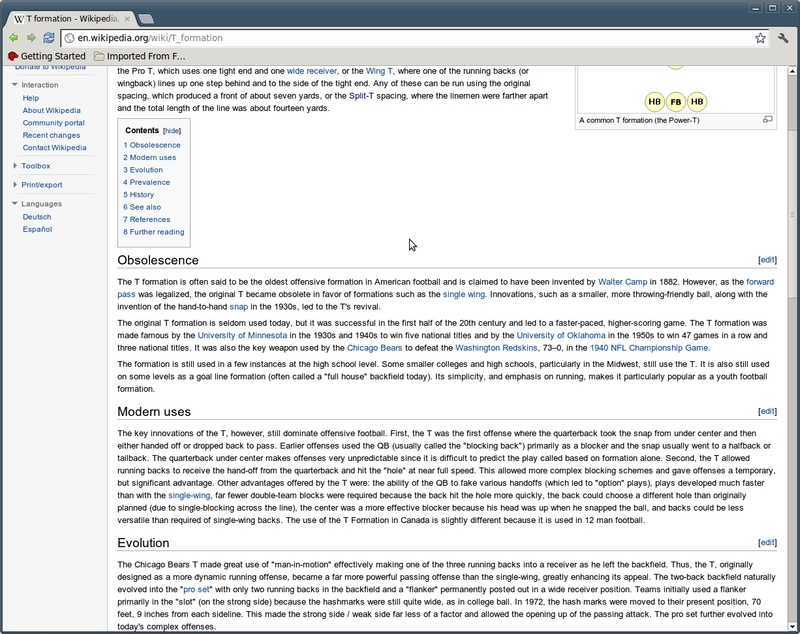 The Stathead blog is now defunct and so, evidently, is the Pro Football Reference blog. I’m not too sure what “business decision” led to that action, but it does mean one of the more neutral and popular meeting grounds for football analytics folks is now gone. It also means that Joe Reader has even less of a chance of understanding any particular change in PFR. 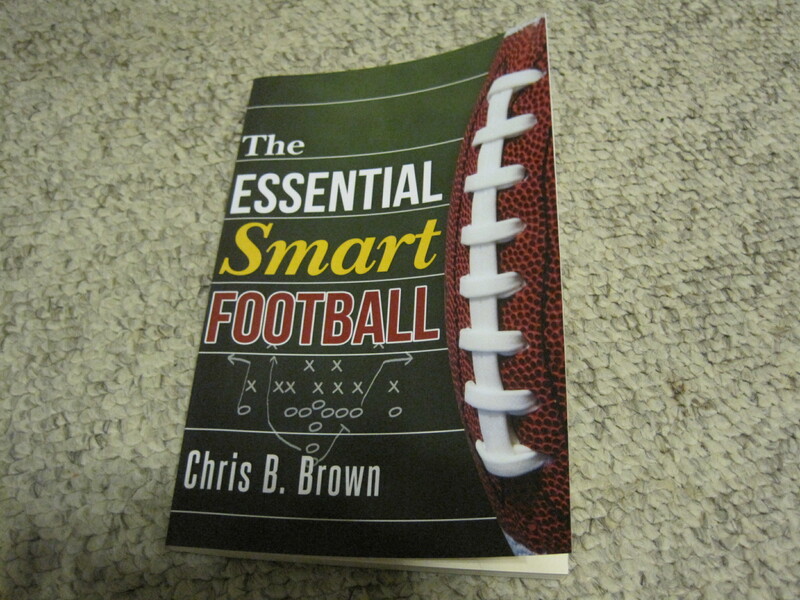 Chase Stuart of PFR is now posting on Chris Brown’s blog, Smart Football. The author of the Armchair Analysis blog, Jeff Cross, has tweeted me telling me that a new play by play data set is available, which he says is larger than that of Brian Burke. Early T formations, or not? U Minnesota ran the T in the 1930s? Really? I’ve been doing my best to confirm or deny that. I ordered a couple books..
No mention of Bernie's T in this book. I've skimmed this book, and haven't seen any diagrams with the T or any long discussion of the T formation. There are a lot of unbalanced single wing diagrams, though. I also wrote Coach Hugh Wyatt, who sent me two nice letters, both of which state that Coach Bierman was a true blue single wing guy. 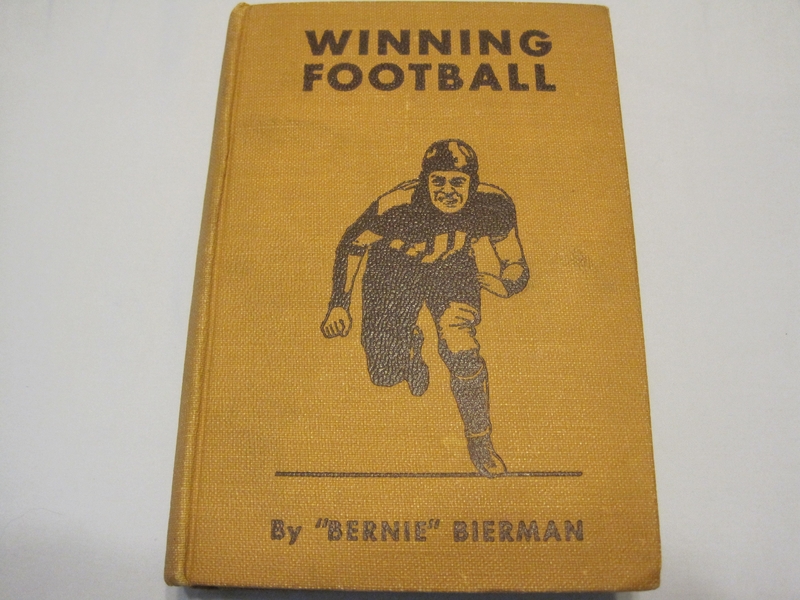 In his book, “Winning Football”, I have yet to find any mention of the T, and in Rick Moore’s “University of Minnesota Football Vault”, there is no mention of Bernie’s T either. I suspect an overzealous Wikipedia editor had a hand in that one. 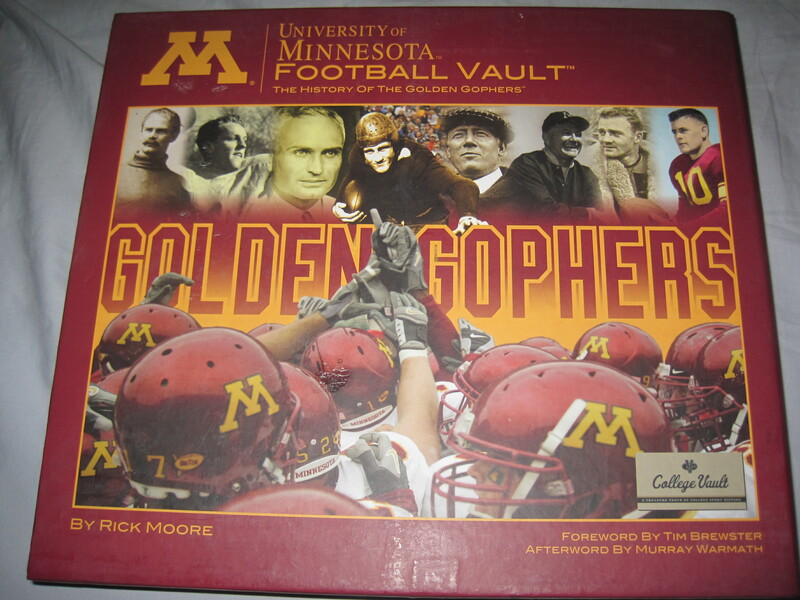 Given that Bud Wilkinson was one of Bernie’s players, a biography of Bud Wilkinson could be checked to see if the T formation was really the University of Minnesota’s major weapon.